It’s always a good thing to have a place in your home to have a space where everyone can has a place for their “stuff”. 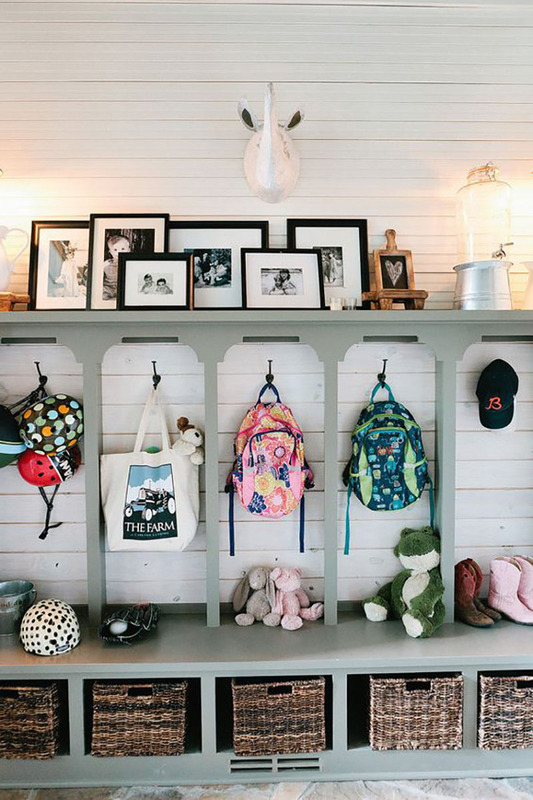 When the kids come home… they know where to put the backpack… the shoes… the coats and everything in between. Great for the adults too. 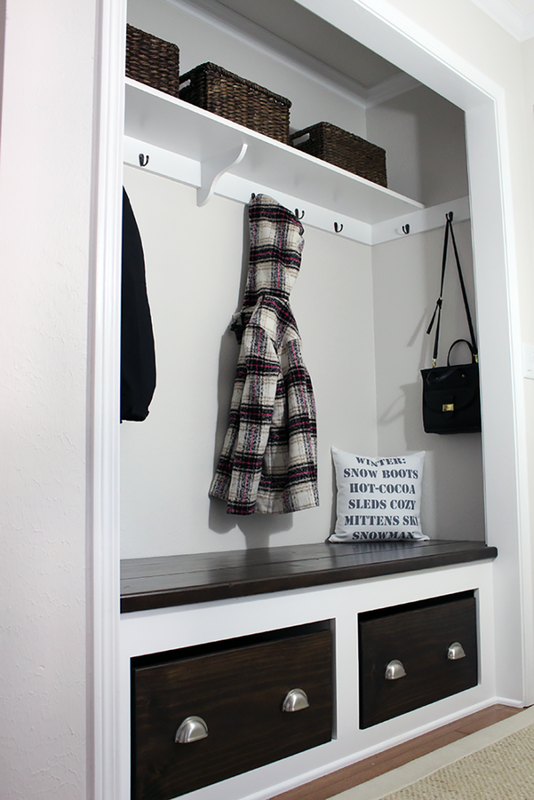 Hang that coat and purse… a place for that umbrella… shoes and more. Doesn’t matter if you have a large space or a small space… doesn’t matter if it is at the front of the home … side or back. It’s just a really useful place if we can make room for it. 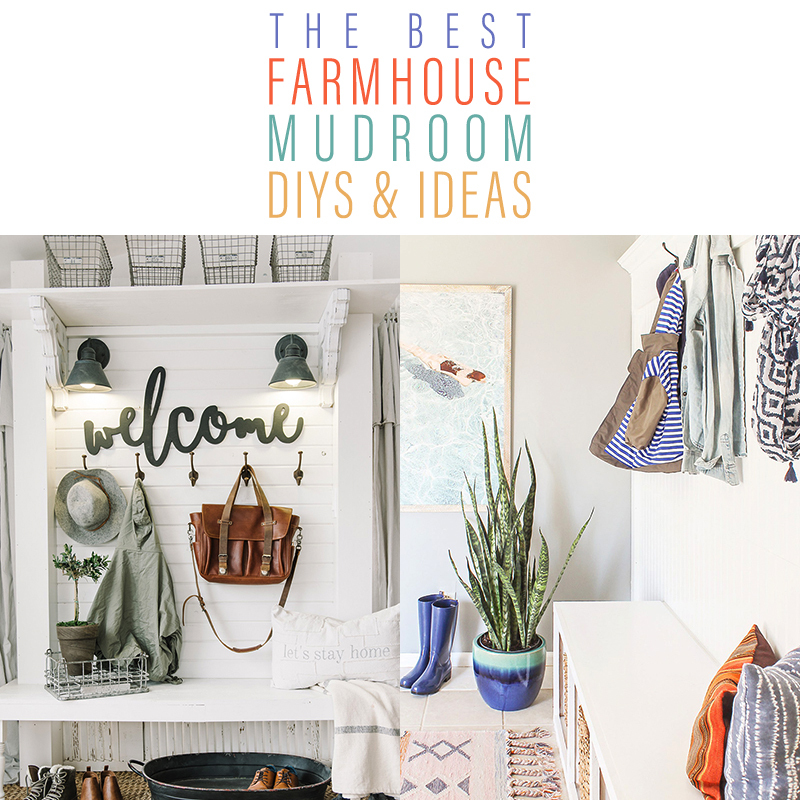 So today’s collection is all about The Best Farmhouse Mudroom DIYS & Ideas. I think you will enjoy and be totally inspired. You won’t believe how simple some of them are! Enjoy and Create. 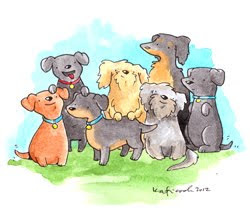 Please remember… all you have to do to get to the tutorial and original post is click on the color Blog Name… all of our blogger friends will be very happy to see you. 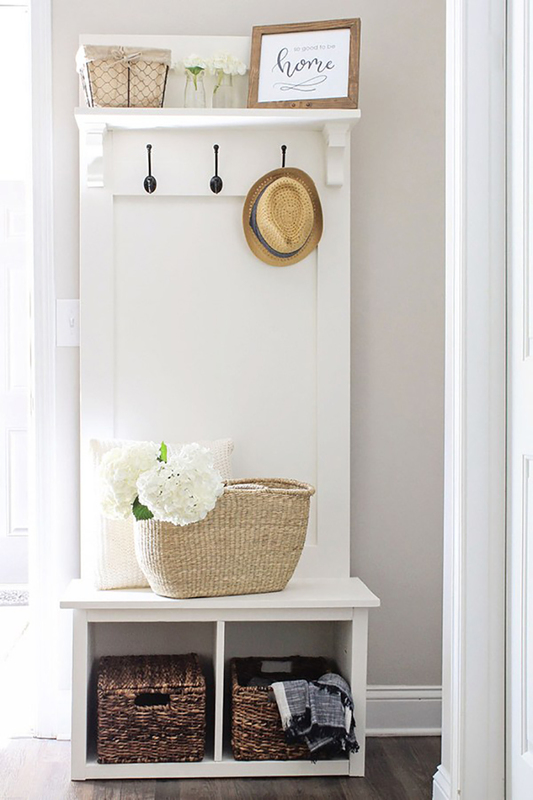 Loving this simple… functional and stylish Modern Farmhouse Mudroom over at One Kindesign. It’s pretty amazing that 3 shelving units combined in the perfect format can actually give you all the space you need to store items in baskets… hang coats… purses… backpacks and more and even have a space where you can store items that you don’t use that often but have them right there in a snap. The wood paneling for the hanging space gives the whole creation such Farmhouse Style and I adore how the horizontal shelf becomes a bench. The whole design of it would work in a Childs room or even a Family Room. I would highly suggest checking out IKEA for some basic shelving units and I bet you can recreate this beauty for about $200-300! 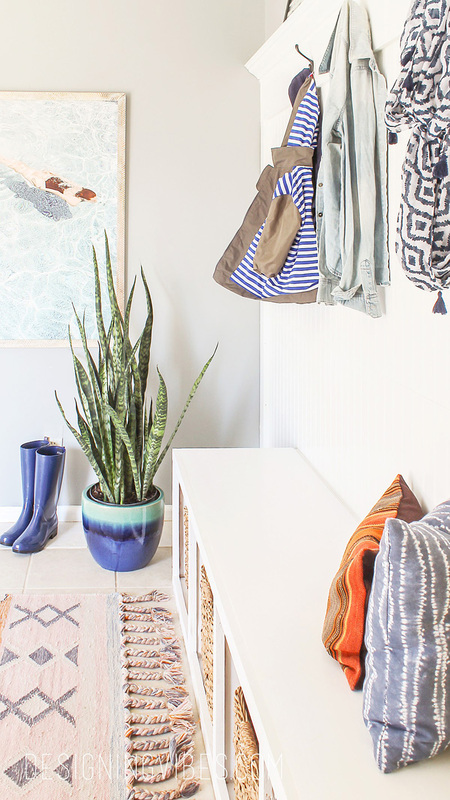 This highly functional and stylish Mudroom over at Style Me Pretty will totally inspire you. It has compartments built in so every family member has their own space. Then there is a shelf for additional storage or a place to display art… photos… treasured family items and more. Maybe this is the style you have been looking for??? As you can see here… even a small space can work efficiently and with total style. There are places to hang… store… sit all while looking wonderful. So if you think that it is impossible for you to be able to have a little Mudroom… it can be done. Head on over to Lela Burris for more details on this makeover. 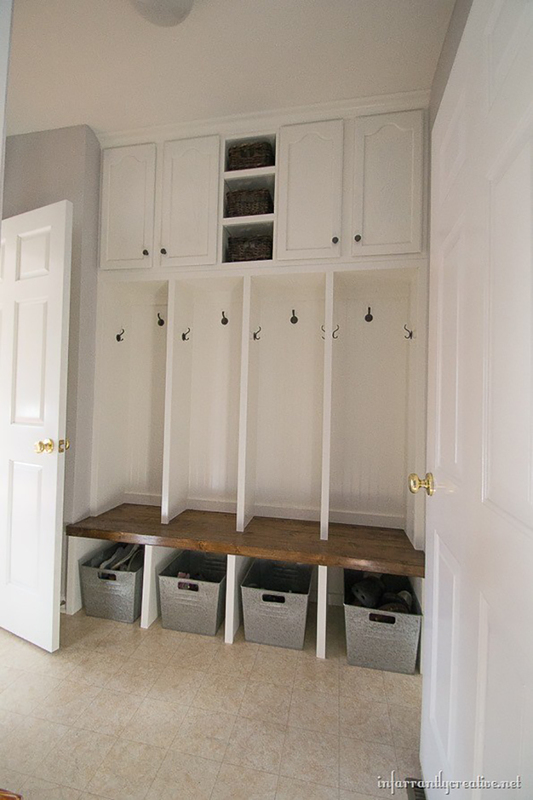 Have you ever considered turning a closet into a Mudroom at the front or the back of the home? Well if you are fortunate enough to have one in that area… it is pretty easy to magically transform it into a highly useful space like this one over at What Karly Said. You can turn a closet into an office so why not right! By removing the doors… adding shelving… hooks… add a built in bench… add drawer or how about large baskets under the bench? Let your imagination soar. Come and check this one out and I know you will be totally inspired to create your own original creation. 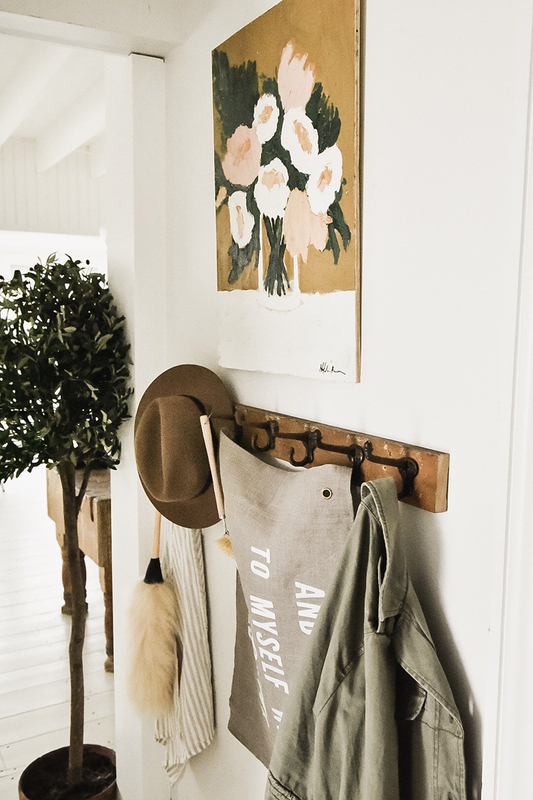 Our friend Liz Marie is sharing a very simple tip with us today… Make a Little Entryway and in her very unique and wonderful style… she shows us how. 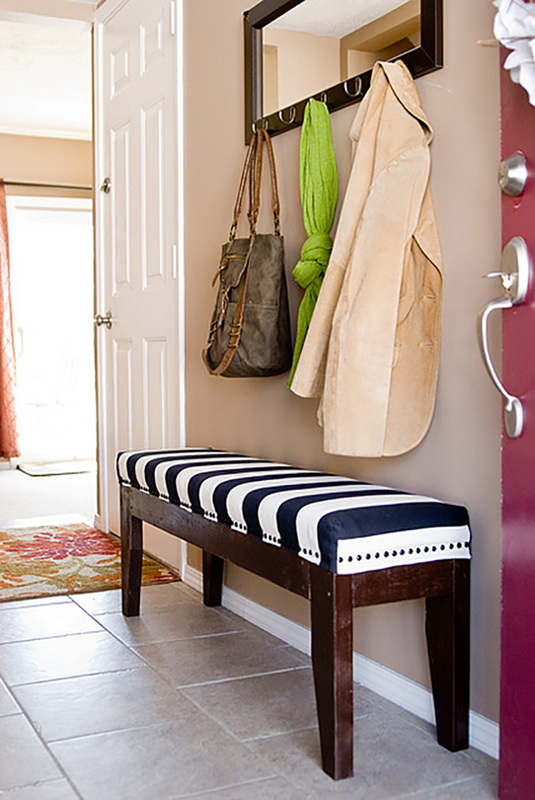 It really works… no matter if you have a small entryway at the front… side or back of the house! She is always sharing so much inspiration with us… love it! 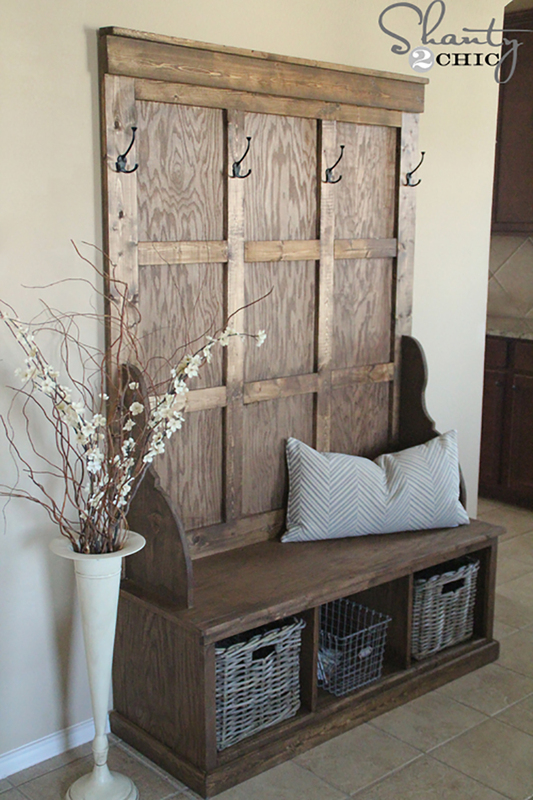 If you have dreamed about having an area in your home with Farmhouse Style Mudroom Lockers but the price tag was just way out of the budget range… you are in luck because Becky over at Infarrantly Creative is sharing her DIY For Mudroom Lockers and the set of 4 cost under $400! You can do it too with her 3 part tutorial. Love the look an the storage potential. Everyone having their own space is fabulous! Loving this idea and I know you will too. 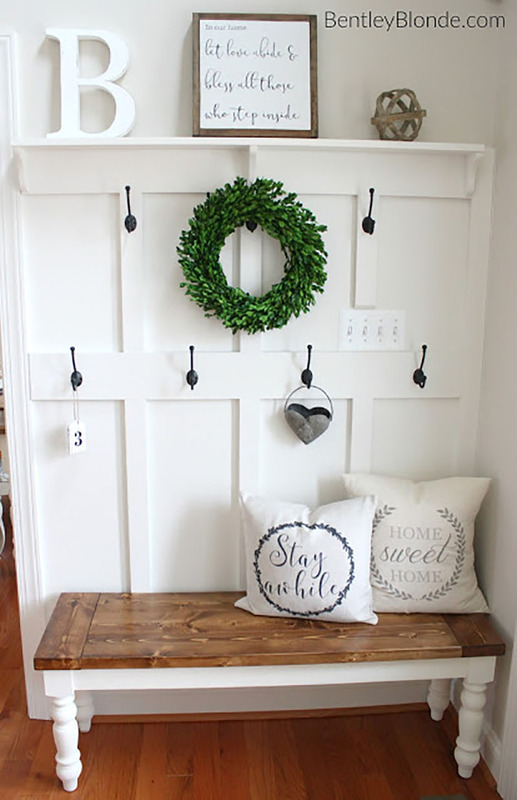 The girls over at Shanty 2 Chic are sharing their Farmhouse Bench Tutorial and it is a thumbs up winner. After you have it built it becomes a great bench and/or base to a wall of organization. 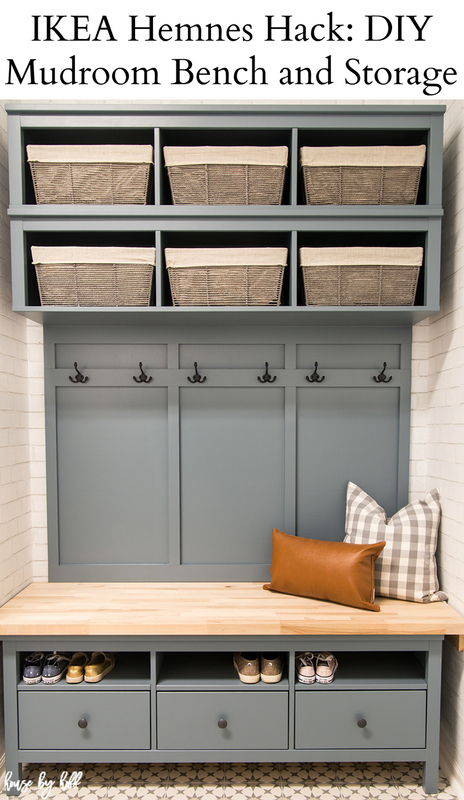 Add some shiplap… shelves… hooks and voila… a great Mudroom Area and it could not be more budget friendly with all the Farmhouse Style you could imagine. You can stain it or give it your favorite paint treatment. Add baskets with chalkboard tags and you are home free. Use your imagination and create your ideal space without breaking a sweat or the bank. If you are lucky enough to have a wall with a corner… it’s pretty awesome what you can do. Even Mom and Dad can have their own space : ) Loving the chalkboard border going around the entire area and it can be personalized for each persons space. Everyone gets their own hook… bench space… basket for odds and ends and a place for their boots and shoes… perfect! Hope Z Plus Interiors inspires you to create the space that works for you. 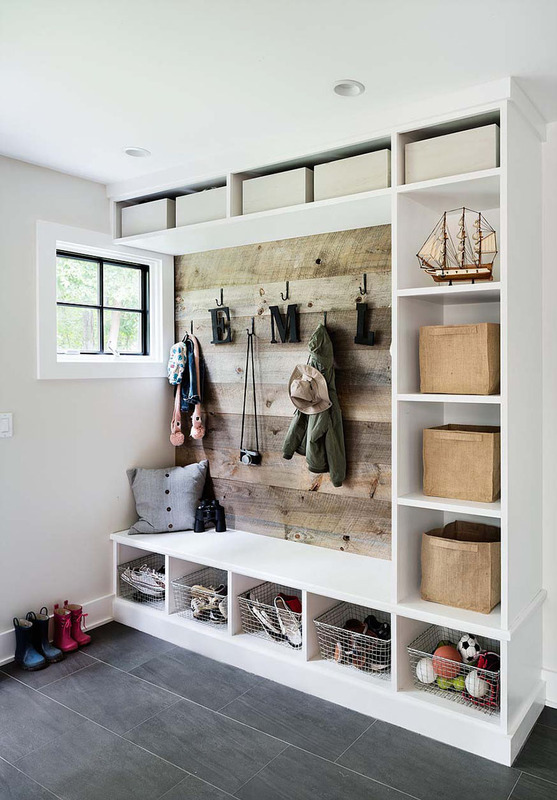 I am personally loving this Mudroom. Fabulous for the front or the back of the home. It’s fresh… clean… eclectic… has a space for everything and would look amazing in any home decor from Farmhouse to Boho and everything in between. 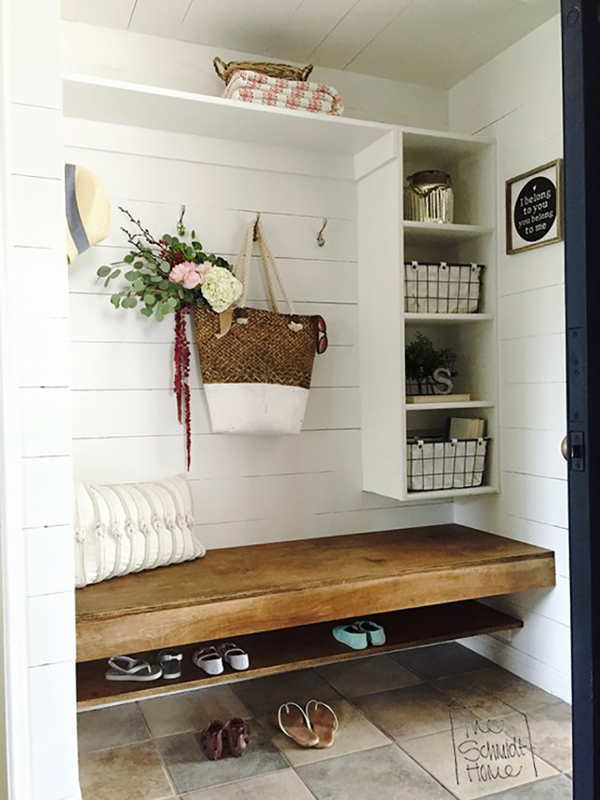 Now here is the best news… When you visit Designing Vibes… there is a DIY for this Custom Mudroom and the cost… wait for it… is UNDER $200!!! LOVE IT! 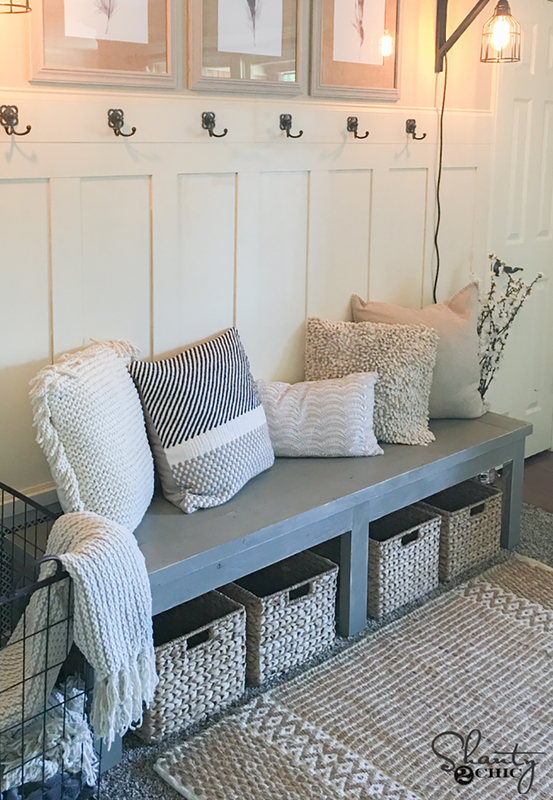 If you want a super easy solution to a Mudroom Space… Ana White is sharing her DIY for this easy Upholstered Bench. Remember while you are looking at the bench… it can have whatever upholstery you are in love with and the legs can be any stain or paint treatment you desire. So all the potential of customization is there. Once you have the bench… you can then add whatever you would like… a mirror with hooks… a decorative coat rack and a shelf where you can add baskets or simple display whatever your heart desires. You can put together a dreamy little space on a tight budget. Use your imagination and create! When you visit Ana White you are going to find the DIY to this Fancy Hall Tree that was built by the girls over at Shanty 2 Chic. The full plans and cut list is waiting for you. In the course of a full weekend you can have this beauty sitting any where in your home. The perfect solution when you don’t have much space but still want the full benefits of a Mudroom area. 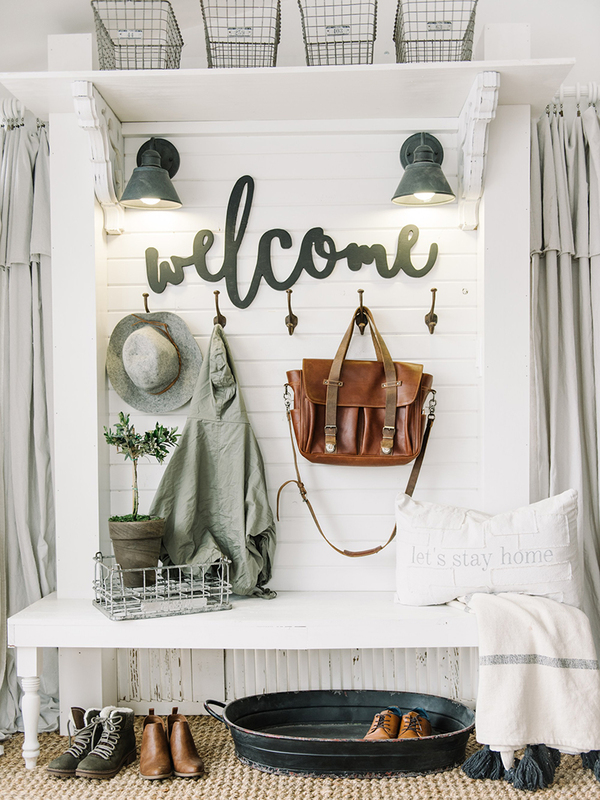 Now it is time to visit our friend Liz Marie and check out her Industrial Cottage Farmhouse Style DIY Shiplap Hall Tree that acts as a wonderful Mudroom space. It has all the room you need and will fit anywhere you have a little bit of wall space. Drop by and visit Liz and Jose and they will fill you in on how they went about creating this area. Tons of inspiration awaits you. I had to get an IKEA Hack in here for you. It is always great to be able to turn to a project that basically has everything you need in it to begin with. IKEA saves us a lot of steps. When you visit House By Hoff you will find the full tutorial to this wonderful hack. It has a great Contemporary Farmhouse Look that will fit nicely with any home decor. I don’t think you could ask for more! Customize it in the color and paint treatment you love… add baskets of your choice and maybe you would like to upholster the bench seat. It will be waiting for all your special touches. Here is an adorable piece that is an amazing space saver. A great piece to add to the front of the home… the side or the back! Just enough for 2 people and has tons of Farmhouse Style Angela from Angela Marie Made is sharing the DIY with us so hop on over… this could be yours by the end of the weekend. Once again… you can customize in so many different ways… paint treatment… hardware… baskets and more. A great solution when space is a problem or to be honest with you… I love it even if you have space… it’s concise… looks great and does the job with style! P. S. – I am a new subscriber.. this was my first entry.. 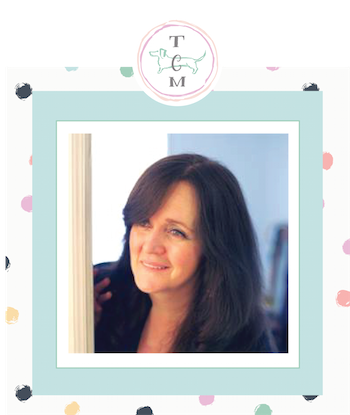 Welcome Denise! So pleased to see you here. You truly made my heart happy with your sweet comment. I am over the moon that you enjoy the collection of Mudrooms and I hope you continue to enjoy your time at The Cottage Market. If there is anything in particular that you would like to see covered… I am all ears! You can put it in a comment or write directly to me at thecottagemarket@gmail.com You take care now and have an amazing day… hugs!